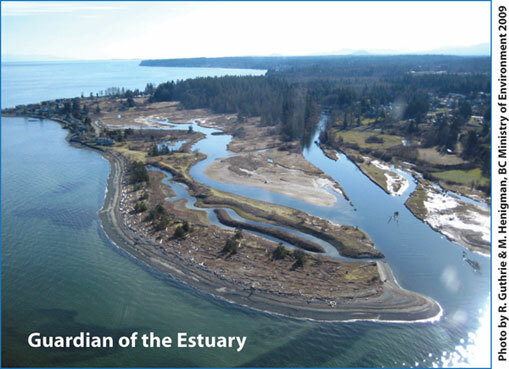 The Little Qualicum River Estuary Regional Conservation Area (LQRERCA) is a 4.6 ha fenced spit located at the mouth of the Little Qualicum River at the western edge of Qualicum Beach. The LQRERCA is surrounded by the Marshall Stevenson Unit of the Qualicum National Wildlife Area and BC's Parksville-Qualicum Beach Wildlife Management Area. Together, these three conservation areas provide critical habitat for marine life and waterfowl at one of the least developed estuaries along Vancouver Island's eastern coast. See Quick Links to the right for estuary maps. In June 2010, the Regional District of Nanaimo and Ducks Unlimited Canada concluded the first management planning process for the LQRERCA, which was acquired by the RDN and DUC in 2003. A range of stakeholders, the public and in particular the neighbours of the LQRERCA were consulted over the course of management plan preparation. An open house held in the fall of 2009 and an on-line survey helped solicit views on the use of the LQRERCA and estuary in general. The final management plan may be viewed or downloaded by clicking on the Quick Links to the right. Questions, concerns or views to express about the LQRERCA?